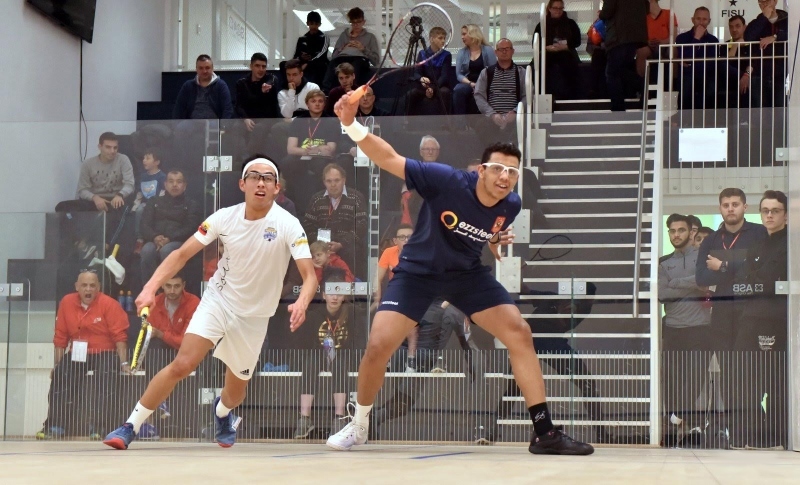 Birmingham opened 22 of its courts to the junior squash world, as the 2019 Dunlop British Junior Open got underway at four venues across the West Midlands city. With more than 750 boys and girls from 50 nations competing across the prestigious tournament’s 10 age categories, the first day was always destined to be a busy one as matches took place over 12 hours at the University of Birmingham, as well as at Edgbaston Priory, Solihull Arden and West Warwickshire Clubs. Given that half of the categories permitted byes into their second rounds for the highest-seeded players, upsets were always likely to be at a premium in the day’s opening stages. And of those top seeds who did contest first round ties, comfortable straight-games wins were generally the order of the morning and early afternoon. Edgbaston Priory Club was the place to be for early surprises as two English boys seeded to reach the quarter-finals in the U11 event bowed out to non-seeds. Ronnie Hickling from Surrey was edged out in five against Russian Omar Mohamed Elkely: 7-11, 9-11, 11-6, 11-3, 7-11. And Berkshire’s Dylan Kalar, despite claiming the first with some ease, was ultimately defeated in four by Marc Voloshin of the USA: 11-3, 11-13, 7-11, 5-11. The Boys’ U13 competition, also at Edgbaston, produced an interesting sequence of first-round results as all of the top eight seeds – including England hopeful  Abd-Allah Eissa – triumphed in straight games over English opponents. Come the mid-afternoon, the drama switched its focus to a different venue and category – with two second-round Boys’ U15 matches at the University producing pulsating five-game contests that led in one to a shock exit and in the other to a close shave. Reigning U13 champion [3/4] Jonah Bryant of England was the highest-ranked player to bow out at the hands of unseeded Dutch opponent Rowan Damming. The Sussex star went two games down, before recovering to edge the third and fourth – but ultimately could not get over the line, going down 6-11, 8-11, 12-10, 11-9, 9-11. And second seed Ismail Mansour from Egypt was given an almighty scare by Colombian [33/64] Juan Jose Torres Lara on the glass court. A routine victory for Mansour in the first game gave little hint of what was to follow, as he found himself placed under greater pressure by his diminutive opponent who played some exhilaratingly tight squash to go 2-1 up, before the Egyptian regained command to claim the fourth with comfort and the fifth with care, prevailing 11-3, 5-11, 6-11, 11-2, 11-8. The evening claimed two more seeded quarter-finalists, each of whom were playing a second match of the day. The Boys’ U11 champion of 2018, Egyptian Ahmed Rashed, came a cropper in the next category up – losing 3-1 at Edgbaston in the U13 event to US opponent Ahmad Haq: 11-9, 1-11, 7-11, 10-12. And in the Girls’ U17 competition, England’s Margot Prow was defeated in five at West Warwickshire by Lina Tammam of Egypt: 11-8, 8-11, 11-6, 7-11, 7-11. As the first day’s play drew to a close, 14 players who had been seeded to reach their respective events’ last sixteens had also been knocked out by lower-ranked opponents across seven of the age-categories – covering the Boys’ U11, U13 and U19, and the Girls’ U11, U13, U15 and U17 events. Watch the action live and for free across five courts via SquashTV and keep up with all the news from the championships with the official website, Twitter and Facebook. The Dunlop British Junior Open is the most iconic and prestigious junior squash tournament in the world attracting the finest youngsters as far as Malaysia and the USA. Former champions include 2018 Commonwealth Games Gold medallist James Willstrop and World No.1 Mohamed ElShorbagy. Tickets to the University of Birmingham can be booked online: book tickets.